You may remember that I have been warning you that the next financial crisis will probably start in the bond market. And it does look like we are getting closer. 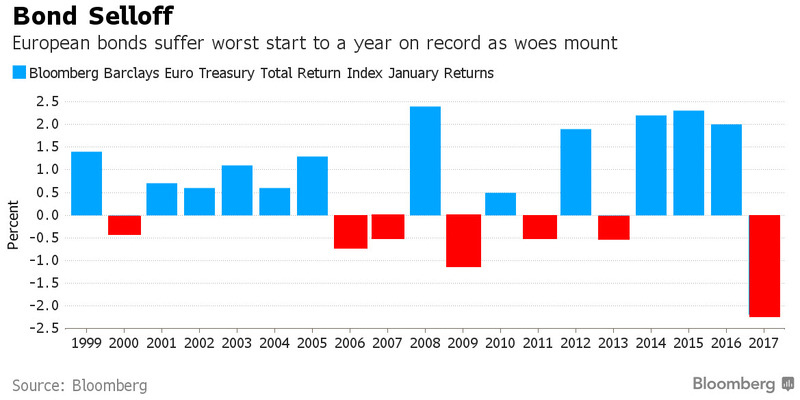 As Bloomberg notes, EU sovereign bonds have handed investors the worst start to a year on record. Losses are mounting quickly. What’s going on? Three factors appear to be unnerving the market. First, there are very important national elections coming up this year in Germany, France, the Netherlands and probably Italy. In all four, anti-EU parties appear to be in the ascendancy. Political risks are rising. Second, there is increasing speculation that the European Central Bank is going to stop its massive purchases of EU sovereign and corporate debt (QE) at the end of this year when the current program is set to end. There are two reasons to think this may be the case: the ECB already owns an extraordinary share of the debt outstanding and is running out of things to buy and the QE stimulus program finally seems to be generating the consumer price inflation the ECB intended, although the ECB itself is pretending otherwise. ECB President Mario Draghi insisted late last year that policy makers weren’t considering scaling back QE and cautioned in January that underlying inflation showed “no convincing signs” of picking up. His message appears to be falling on deaf ears. And third, there is that little matter of inflation which is the one thing that we can count on to erode the value of bonds. The latest data clearly shows that the ECB is now way behind the curve, with inflation definitely beginning to accelerate in response to negative interest rates and ECB asset purchases. The ECB’s QE program now totals 1.32 trillion euros ($1.42 trillion) since March 2015. It’s by far the biggest bid in the EU bond market. What happens to this market if this bid is withdrawn at the very moment when political uncertainties are at their highest? Do not think this is only a European problem, dear reader. As yields rise more quickly in the EU than in the U.S., expect more near term downward pressure on the dollar. Just another reason to like gold at current levels.